Data and documents are crucial to the pharma ceutical industry. But how do you move millions of documents a year and simultaneously ensure compliance with all relevant guidelines for every single document? Gernot Lang, Head of Document Management for Boehringer Ingelheim, and IT Project Manager Dr. Helge Gottwald explain how fme migration-center helps Boehringer Ingelheim’s IT department do just that. Would you like to know more about ongoing projects, visit us at a trade show or attend one of our events? Then this is the place to be. Stay tuned on the latest press releases about fme, our products, solutions and client success stories. Keep up-to-date with the latest technology trends at trade shows, conferences and workshops. Organized jointly with our partners we attend shows or invite you to workshops and webinars. DANBURY, CT, February 7, 2019 – fme US, a leading supplier of Enterprise Content Management consulting and technology services to the Life Sciences Industry, has announced its intention to provide Intelligent Document Classification and Metadata Enrichment services under the fmeMATRIX brand. fmeMATRIX will provide Life Sciences companies with tools to ensure that important documents are classified accurately and have the necessary metadata to support the need to quickly and effectively identify documents associated with key business processes. fme US recently announced a strategic partnership with Docxonomy LLC, a leader in Artificial Intelligence and Machine Learning solutions for document classification, and will leverage their core technology to power fmeMATRIX. By combining fme’s Life Sciences industry business process and document content knowledge with Docxonomy’s “engine”, the solution will provide clients the opportunity to improve document quality and create greater insight into important regulated content. fme US will be working with clients over the coming months to leverage the core fmeMATRIX capabilities and further develop business case specific modules for clinical, regulatory, RIM and quality manufacturing. Any companies interested in participating in this exercise should contact fme US to discuss such opportunities. DANBURY, CT, February 4, 2019 – fme US a leading supplier of Enterprise Content Management consulting and technology services to the Life Sciences Industry and Docxonomy, an intelligent search and discovery company, today announced a strategic partnership to bring to market a series of Intelligent Document Classification and Metadata Enrichment solutions. Life Sciences companies have seen a gradual maturation of content management technology platforms over recent years, with leading vendors now providing native cloud offerings. While these advancements have improved productivity and are reducing technology integration needs, business users are still handicapped by the incomplete and inconsistent classification of regulated documents. Without enriched and connected metadata, companies are unable to effectively query, analyze and utilize important information required to support business and regulatory compliance requirements. The fme and Docxonomy partnership brings together strong Life Sciences industry knowledge, important technology capabilities and document management experience to deliver solutions focused on clinical, regulatory, RIM and quality manufacturing document types. Based on their Artificial Intelligence and metadata modeling capabilities, these solutions will allow companies to improve document quality across the enterprise. fme US has been included as one of the 10 most promising ECM Consulting/Implementation Services Companies for 2018 in the September Issue of CIO Review Magazine. To read the full article please click the link below. Danbury / Braunschweig, 12-04-2017 – Today, Nigel Whitehead, an experienced Life Sciences and Enterprise Content Management executive, joins Frank D’Entrone, CEO of fme US, LLC, in the fme US management team. With this personnel decision, fme US lays the foundation for future growth and further operational excellence. Frank D’Entrone now serves a dual role in which he can best contribute to the expansion of the business. He continues to be involved in all strategic aspects of the business as president of fme US. Furthermore, he will increase his focus on sales to grow the fme US client base. Nigel Whitehead takes over the day-to-day operation in his new role as Chief Operating Officer (COO). “I am happy to have Nigel on board to support me by managing all day-to-day operations. Sales, delivery, marketing, finance and HR will report directly to Nigel. This is an important step in the expansion of the fme business in the US and allows me to concentrate on further extending our client base,“ explains Frank D’Entrone. Nigel Whitehead brings more than 30 years of experience in the Life Science Industry to the role. He has held a number of senior executive roles including the management of a solutions business with a strong focus on ECM. “I am looking forward to helping Frank in moving the success story of fme US to the next level. By relying on the great customer base and our excellent team I feel confident to achieve our targets for the future,” says Whitehead. Before he joined fme in December 2017, he was the CEO at Advanced Health Media and held positions as Managing Director at CSC Healthcare Group and President Life Sciences at First Consulting Group. 7-13-2017 | Alexa, please open OpenText Documentum! Alexa, please open OpenText Documentum! Braunschweig, July 2017 – fme proudly announces that they have developed a showcase which allows to operate an OpenText Documentum system with voice control through the Amazon Alexa service. With this showcase fme opens up completely new possibilities to use Documentum and demonstrates at the same time how lean and process-oriented business applications will look in the future. In times of user-friendly mobile apps and web applications employees are looking for intuitive business applications to simplify their everyday work. The voice-controlled intelligent personal assistant service Alexa, developed by Amazon, offers countless new opportunities for co-operation between man and machine. A team of dedicated fme developers in Munich, who work with OpenText Documentum on a daily basis, developed an interface between Amazon Alexa and OpenText Documentum to demonstrate a possible business use case. „We have developed this exemplary showcase for the use case ‘operating OpenText Documentum with voice-control’. The application includes only the most essential functionalities to make it easy to work with and achieve your goal instantly, which increases the user acceptance.” explains Markus Oponczewski, Director Business Unit at fme. “Our application could assist OpenText Documentum power users with frequently recurring queries or processes for special documents. Alexa could be programmed to help with explanations for individual tasks in OpenText Documentum. We are also thinking about an interactive tutorial lead by Alexa which would help new employees to find their ways around the complex ECM platform – so the app would shorten the time for introductory trainings of new employees.” continues Oponczewski. The showcase infrastructure is based on an OpenText Documentum system and Documentum REST Services installed on Amazon Web Services (AWS), a Spring Boot application running on a public Pivotal Cloud Foundry installation (Pivotal Web Services). The OpenText Documentum client is attached via WebSocket connection to react on state changes which bring up the documents etc. Architecture of the fme showcase connecting OpenText Documentum with Amazon Alexa. A dedicated Documentum 7.3 environment was set-up in the backend of the showcase which runs on the cloud services of Amazon Web Services (AWS). “We wanted to create a simple, scalable and reusable environment. 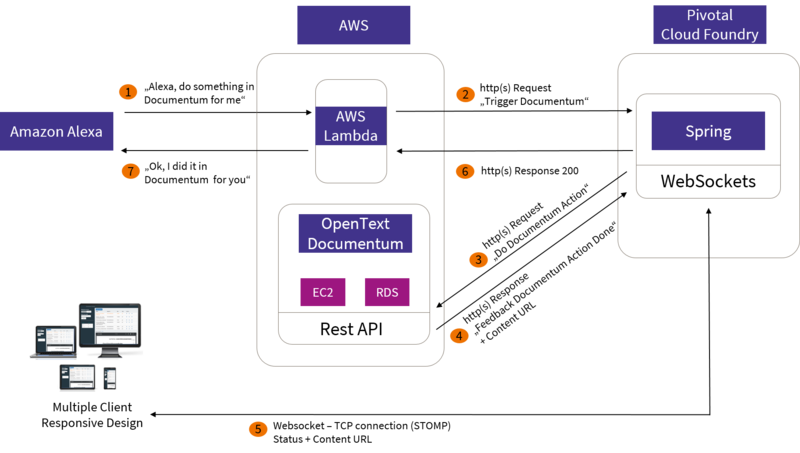 The underlying repository runs on an OpenText Documentum Content Server and uses the Remote Database Service (RDS) from AWS to archive the meta data. To communicate with the front end we used the REST-API of OpenText Documentum” explains André Aretz, Managing Consultant at fme. Different configuration levels allow to program the application for simple commands as well as for complex process requirements. A short demonstration of how OpenText Documentum can be operated by voice control can be found on > fme’s YouTube Channel. Braunschweig, January 2017 – Together with fme US, fme AG supports the globally acting Life Sciences Company CSL Behring in migrating data from the enterprise content management system EMC Documentum to the new client D2 to lay the technical basis for the introduction of the EMC Life Science Solution Suite. fme provides its EMC-certified product migration-center to transfer the content to the new D2 environment in a secure and efficient manner. Global control of content with seamless information sharing is an important key factor for innovative and international operating Life Sciences Companies. Therefore, CSL decided to introduce the EMC Life Sciences Solution Suite with its business area-specific modules, which ensures consistent access, compliance and security while improving business productivity and efficiency. “A big milestone of this project is the migration of our content to D2. fme is an important partner in the field of content migrations for CSL offered as a global service. We used the fme migration product when we moved to D2,” explains Johannes Lichtenfels, Senior Manager Business Solutions Document Management of CSL. Currently, CSL Behring is using the enterprise content management solution EMC Documentum including Webtop and D2 as interface. The D2 layer is the technical basis of the EMC Life Science Solution Suite, which is specifically developed for supporting business processes such as quality assurance, research and development etc. With the help of fme’s migration experts and their software migration-center, CSL was migrating content from Documentum to the D2 application. “We are looking back on almost 10 years of good cooperation between CSL and fme and we are very happy to have served CSL internationally again with this large migration project,” says Florian Piaszyk, Director fme Products. migration-center is a full function, out-of-the-box software solution, fully documented, easy to deploy, with an excellent graphical user interface. The product has been EMC-certified for ten years and is able to carry out highly automated, large volume document migrations without interrupting any of the normal business operations. CSL Behring is a global biotherapeutics leader driven by its promise to save lives. Focused on serving patients’ needs by using the latest technologies, we develop and deliver innovative therapies that are used to treat coagulation disorders, primary immune deficiencies, hereditary angioedema, inherited respiratory disease, and neurological disorders. The company’s products are also used in cardiac surgery, organ transplantation, burn treatment and to prevent hemolytic disease of the newborn. CSL Behring operates one of the world’s largest plasma collection networks, CSL Plasma. The parent company, CSL Limited (ASX:CSL; USOTC:CSLLY), headquartered in Melbourne, Australia, employs nearly 20,000 people, and delivers its life-saving therapies to people in more than 60 countries. For more information visit www.cslbehring.com and follow us on www.Twitter.com/CSLBehring. Braunschweig, 9th January 2017 – fme AG today announced to have won many new customers for its product migration-center in 2016. »We are very happy that these well-known companies and institutions chose migration-center for their content migration projects and are looking forward to a successful cooperation also in the upcoming years«, states Florian Piaszyk, Director fme Products. With over ten years of experience in the product business and more than 350 successful migration projects so far fme’s migration-center is one of the leading migration products available on the market. Get an overview of all current migration-center customers. Braunschweig, 20th December 2016 – fme AG and Tieto Corporation announce a strategic partnership. fme is an IT service provider and digital transformation specialist based in Braunschweig, and Tieto is a leading software and services company headquartered in Helsinki, Finland providing mainly IT, R&D and consulting services with a focus on the Nordic region. This new partnership combines Tieto’s competence in the renewal of their customers’ business and IT with fme’s market leading product for content migrations. The signing of the contract has made Tieto a technology partner for migration-center in the Nordics region. fme’s software and the accompanying best practices methodologies paired with Tieto’s competence in renewing their customers’ business and IT will lead to successful migration projects for their clients. “We are very pleased that with Tieto we have found a strong partner in the Nordic region for future content migration offerings. Together we will have the chance to make the product migration-center also known in small and medium sized companies in the Nordics and benefit from Tietos’ already existing network”, states Florian Piaszyk, Director fme Products. Customers will benefit from this new strategic partnership: They have access to a proven migration product combined with the service offering by a familiar, local and professional partner and the additional support of the vendor in questions of content migrations. Tieto aims to capture the significant opportunities of the data-driven world and turn them into lifelong value for people, business and society. We aim to be customers’ first choice for business renewal by combining our software and services capabilities with a strong drive for co-innovation and ecosystems. Braunschweig, Germany, October 2016 – In August fme conducted the first migration-center client survey. The results from the international survey have been evaluated and fme’s product team is working on integrating the valuable feedback into the software and the relating processes. The survey was conducted by an external telemarketing partner and resulted in 41 interviews with migration-center clients around the world. The clients were asked how likely it was that they would recommend the migration-ceter to a collegaue or business partner. Depending on the answer the interviewer asked for details which make the product stand out or for issues which need improvment. No matter if related to the software quality, the usability or the support processes, the clients had the chance to give their feedback on how to improve the product in the future. Braunschweig, Germany, August 2016 – fme AG, an IT service provider and digital transformation and business intelligence (BI) specialist based in Braunschweig, has announced its partnership with Jedox AG, a leading provider of business intelligence and corporate performance management software. This new partnership will allow fme’s customers to benefit from the high-performance planning functions included in Jedox Suite, which vastly simplifies planning processes. “By partnering with Jedox, we are adding planning components to our BI service portfolio. Combining these new components with our existing analysis and reporting solutions from manufacturers such as Qlik will allow us to offer our customers a holistic approach: the fme BI framework. This framework will provide valuable 360° insight into company data – from data integration, to planning, analysis, and reporting solutions, through to the implementation of visualization standards,” reports Dirk Bode, CEO of fme AG. fme relies on tailored BI products and offers an all-round BI service that includes workshops on needs analysis, technical solution integration, training sessions, support, and maintenance. Customers particularly benefit from fme’s extensive expertise in the life sciences and manufacturing industries. “fme and Jedox combine a comprehensive self-service philosophy that enables users in all departments to independently analyze, report on, and plan data. Jedox does a perfect job of using existing data discovery solutions and, thanks to its centralized Web planning application, cuts the amount of time required for budgeting, forecasting, and planning cycles,” explains Jörg Rieth, Regional Senior Partner Manager DACH at Jedox AG. “Under the slogan Information instead of Intuition, we provide timely availability of critical data at all management levels with our BI solutions. The internally-developed, exceptionally clear dashboards leave no room for misinterpretation and improve not just reporting but also the organizational culture of our clients,” adds Dirk Bode. Braunschweig, Germany, July 2016 – fme AG has developed an app for smartphones featuring the WatchKit extension for its long-time customer Volkswagen Aktiengesellschaft. This new app delivers a whole new shopping experience for people being in the market for a car, who now have access to the full inventory of Volkswagen vehicles right there on their wrist. Users receive a message that appears on their Apple Watch when a car is found that matches their search criteria. 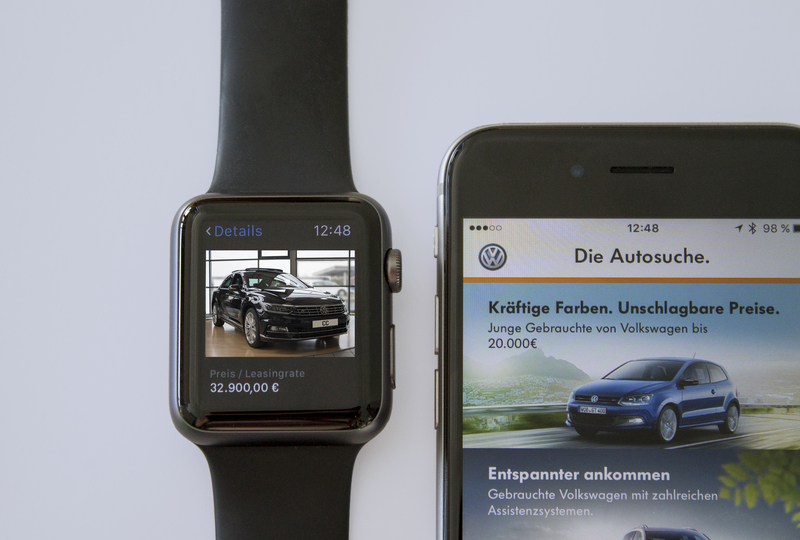 Die Autosuche, the vehicle search app developed by fme for iPhones with the WatchKit extension, brings together innovative technologies and new products. “With our expertise in digitization, it was a really exciting project for us from day one. The app is a new whole way for prospective buyers to find their dream car. It provides proactive support in the form of messages and displays vehicles that match the user’s previous search criteria. The standard agile software development approach taken by fme made it possible to identify bugs and flaws in the app at an early stage and eliminate them quickly. This strategy has helped allow us to respond to customer requirements more flexibly and reduce development times,” says Moritz Rosin, Managing Consultant at fme AG, who oversaw the project. A core component of the iPhone app is the search engine used to configure the search for vehicles from sources like the inventory of new, used, and previous year’s models on the platform. The search engine sends a message to the Apple Watch whenever a new match is found. The vehicle’s detailed specs are shown on a page optimized for display on the Apple Watch’s small screen. This page includes a photo and key information about the car. The user can save the vehicle, plan the route to the dealer, or display the full detailed view on the iPhone. Optimized for smartphones, the vehicle search app offers a modern, intuitive user interface. Users enter their search criteria on the search screen and are then immediately shown a clearly arranged list of matches. They have the option to view the vehicle’s details, save the vehicle to their favorites, share it, and much more. “We are pleased that Volkswagen Aktiengesellschaft chose us to design and implement the app as well as manage the project. The high-tech, efficient vehicle search app, which is available to their customers now, is keeping up with the times,” adds Moritz Rosin. The German-language app can be downloaded on the iTunes store. Braunschweig, June 21, 2016 – fme AG is proud to announce the upcoming major release of their product migration-center, the leading migration platform for highly automated, large volume content and data migrations in Q4 2016. migration-center 4.0, which is currently being developed, will be released with a new and modern user interface, enhanced user experience and further additional new functionality that helps clients to improve their productivity with migration-center even further. Over the last years, fme’s migration-center clients supplied a lot of valuable feedback. fme’s Product Business Unit has tried to integrate as many of those feature requests as possible in migration-center 4 in order to further streamline the overall migration process. The most important innovations and improvements to mention are multiple-value mapping lists, new transformation functions, custom processes, scheduler enhancements, and advanced folder creation. A modernized migration-center job server’s architecture will allow multi-threading in all adapters, easier adapter deployment, and the integration of any kind of custom adapters or jobs – so that clients can expect faster migrations and support for new use cases. The job server and the client will use state-of-the-art REST web services for communication instead of proprietary protocols, making it even easier to implement custom adapters/jobs. Another major change in migration-center 4 will be the client application. fme has developed the new migration-center client from scratch based on .NET technology. This leads to a state-of-the-art user interface with a much better user experience. Moreover, it allows keeping the client up-to-date with new developments in user interface design. The first release of migration-center 4 is planned for early November this year. fme starts with the three mostly used adapters and will add all the other adapters subsequently. Braunschweig, Germany, April 2016 – fme is one of the first IT service providers to receive the Development Edition of Microsoft’s HoloLens augmented reality glasses. As such, fme is part of the small first wave of companies that successfully applied to acquire a pair of the coveted augmented reality glasses for developers in spring 2016. These glasses will allow the company to guide its clients through digitization processes in an innovative way. “We are very happy that Microsoft selected us for the first delivery phase. We are going to use the HoloLens to bring our visions to life, working hand in hand with our strategic partners and clients to create thrilling new customized customer experiences,” says Dirk Bode, CEO of fme. fme is focusing on developing new technologies for its clients in the automotive and consumer goods sectors. The IT service provider possesses comprehensive virtual and augmented reality expertise, and will develop HoloLens applications to make the sales process an innovative, emotional experience for end customers and further promote digital transformation within companies. Customers who are ordering a custom configured product such as a car or visiting a booth at a trade fair will be given a pair of branded virtual reality glasses made of cardboard to take home. At home, they can take a good look at their car, test out various features, and share their experience over social media. fme will also use the HoloLens to develop entirely new point-of-sale concepts – the company will create a new, highly emotional sales process by entering into a dialog with the buyer and creating a custom product within a virtual reality, instead of relying upon physically existing models. “The future is now! When end customers, designers, and event participants use our 3D applications in combination with Microsoft’s augmented reality glasses, they take a massive leap forward in the digital realm and remain a step ahead of the rest. We look forward to accompanying them along the way and further expanding our virtual reality portfolio,” says Manuel Schiavo, who is in charge of virtual and augmented reality activities at fme. Braunschweig / Frankfurt, November 2015 – fme AG, an IT service provider with a focus on solutions for life sciences and industrial manufacturing, gets Daniel Pelke, an experienced IT specialist and Digital Evangelist, on board. Having completed his studies in Computer Sciences in Munich, Daniel Pelke was among others employed at Hewlett Packard as Business Development Manager before he joined Documentum as a PreSales Director for CEEMSA in 1997. Starting in 2008 he became Technical Director for the Software Group at EMC and lastly held the position as Head of Center of Expertise and CTO there. Since November 2015 fme Daniel Pelke manages the Business Unit for Life Science Solutions in Frankfurt. A global insurance company was in need to upgrade their Documentum 6.5 SP2 system to Documentum 7 to get to a supported version and have access to the new client technologies and functionalities for their more than 3,000 Documentum users. Furthermore, a legacy database application had to be decommissioned and integrated into the existing Documentum platform. To provide better performance and availability with Documentum 7 the whole infrastructure of the complex environment had to be redesigned and rebuilt. The company partnered with fme US, LLC to carry out the project together with the client’s team. As a result the insurance company now regulates a supported environment which results in saved costs for extended support. The major driver to upgrade from Documentum 6.5 SP2 to D7 was to save costs for extended support and provide a longterm document management solution with a fully supported environment. Furthermore, the intention was to leverage the new functionalities and technologies of D7 like xCP 2.x or D2 4.x to provide the highest amount of usability for its employees and to fulfil the new client requirements. fme and their customer were working closely together to complete this initiative within given time constraints. As part of this initiative fme and the insurance company also jointly participated in the D7 Rapid Success Program (RSP) from EMC which greatly helped to resolve issues and answer questions within a short timeframe. In collaboration with fme AG, a large internationally working life sciences company set up a compliant Global Records Management System. Purpose of this project was to implement a solution to help the company to assure global and local compliance with the increasingly complex legal, regulatory, business and security requirements in the field of records management. The globally used EMC Documentum Webtop application was identified as target for the official document structure as well as for administration functions that were built to manage the retention periods according to the business tasks. The new global Records Retention structure with its supporting functionalities allows employees globally to store their retention relevant emails and documents more easily and efficiently based on their specific business tasks. Automatic retention policies will assure the compliant storage of the data according to the specific retention periods that are required. A high performance ActiveX-based drop zone allows users to import Outlook emails easily into the Records Retention system. ensures a much higher sustainability in filing and archiving documents. facilitates cooperation across the world by a consistent basic folder structure. helps saving time by providing predefined retention rules deposited to the mutual folders. In collaboration with fme AG, Lenzing AG has replaced its old IXOS SAP archive and modified EMC² Documentum, its existing content management system, to serve as an SAP archive. The Documentum infrastructure has been optimized for stability and reliability. The archive data was migrated using »Migration4ArchiveLink«, a proven migration tool from our longstanding partner KGS. In addition, complete documentation was provided and there was no significant downtime. Lenzing AG has been using IXOS as its SAP archiving solution for several years now. When the project started it contained about 1 terabyte of archive data from SAP. However, there were SAP upgrades planned and the maintenance contract had expired soon so the IXOS Archive was to be replaced with an alternative archiving solution. Since EMC² Documentum has been in use as enterprise content management system (ECM) at Lenzing since 2000, the existing infrastructure was to be used or rather expanded to be also used as archiving solution and the data was to be migrated from the IXOS legacy system. The main objective was to replace the IXOS Archive as soon as possible because the service contract had expired. The existing Documentum infrastructure was to be used as an archiving solution. The Documentum Archive needed to be fail-safe and stable before going live. Alternatives for the scan client and IXOS Viewer, a system to display archive documents, had to be found when the IXOS Archive was replaced. Further, the archived documents and data should be accessed via SAP only. Furthermore, the replacement of the archive and all affected components was to be done with a minimum of downtime. By using a proven migration tool, the SAP archive data was reliably and traceably transferred. The consolidation of document management and SAP archiving to the unified EMC2 Documentum platform will save future maintenance and administration costs. Braunschweig, Germany, 27 May 2015 – fme AG, an IT service provider specializing in solutions for life sciences and industrial manufacturing, can look back on a successful 2014 fiscal year. The fme Group increased its revenue by approximately 10 percent to EUR 16.8 million and once again reported positive earnings. Thanks to internal restructuring, customers benefit from an expanded range of services. An expanded portfolio and continued stable growth are on the agenda for fme in 2015. “We are pleased with these very positive results. For over ten years, fme AG has been operating at a profit and experiencing steady growth. However, this is no reason for us to rest on our laurels. We have used 2014 to take internal measures designed to put us in an even better position to succeed and to expand our range,” says fme CEO Dirk Bode. The business was restructured in various areas over the past year with the aim of offering customers the best possible service and support. A new business unit focused on business and IT consulting was established by fme in Braunschweig, Germany, offering services ranging from process consulting to project and program management and mobile application software development. In addition, the Competency Center Business Intelligence now operates as an independent business unit to great success. fme products like docspread and migration-center also posted a successful year. A total of 19 new customers, including well-known companies such as Medtronic and comdirekt Bank, benefited from using migration-center, a content migration software product. New to the range is the InfoArchive solution from EMC, which removes legacy applications from service while making the stored data available long term. Solutions such as these assist companies in significantly reducing their IT costs. Furthermore, the portfolio was expanded to include the social collaboration platform Jive, a tool that allows companies to greatly improve the efficiency of collaboration between employees, customers, and business partners. fme as a Group continued on a path of strong growth in 2014. The company recorded in Romania and at its U.S. subsidiary double-digit growth in revenue compared to the previous year. For 2015, the fme Group is planning to focus especially on growth in fme products, business intelligence, and consulting as well as on further expanding the social business collaboration range using Jive. April 29th, 2015, Las Vegas, Nevada – The InfoArchive Consortium, an unprecedented alliance committed to scaling and fostering the adoption of next generation unified archiving based on the EMC® InfoArchive platform, today announced the releaseof a new whitepaper addresses the ‘data deluge’ problem affecting large companies and the need for next generation archiving strategies to address this challenge. Customer Communications Archiving: The Time is Right to Leverage Next-Generation Archiving, is the first in a series of TechTarget whitepapers commissioned by the InfoArchive Consortium to share best practices, provide technical advice and promote a unique archiving approach that leverages the EMC InfoArchive platform supporting both structured and unstructured content to be consolidated into a single repository. An unprecedented growth in business information is challenging companies who need to store, manage and leverage that information in order to operate their business. This series of thought leadership white papers published by the members of the InfoArchive Consortium in partnership with TechTarget examines what is driving the adoption of next generation archiving solutions from the perspectives of application decommissioning, archive migrations, customer communications archiving and data extraction. “The InfoArchive Consortium is helping EMC address the challenges and define the market for solutions that require next generation archiving solutions like InfoArchive. This paper is essential reading for anyone seeking guidance on next generation customer communications archiving solutions”, said Jeroen van Rotterdam, Vice President of Engineering and Chief Technology Officer for EMC Enterprise Content Division. Download the Customer Communications Archiving: The Time is Right to Leverage Next-Generation Archiving by clicking here. Crawford Technologies: Specialists in high-volume print stream archiving for the Documentum and InfoArchive platforms. Flatirons Solutions: Specialists in legacy application decommissioning for the InfoArchive platform. FME: Creator of migration-center for InfoArchive and specialists in content migration regardless of the source and target systems involved. IS Solutions: Specialists in systems integration and implementation of InfoArchive solutions. Reveille Software – ensuring peak performance with enterprise service level management for InfoArchive. Solix: Solix EDMS is an enterprise data management platform for archiving and decommissioning structured enterprise applications. The Windward Group: Data Migration experts and creator of The Connector for EMC InfoArchive, an ETL tool designed to provide an all-encompassing UI to manage the archiving process from a customer’s legacy systems to InfoArchive. EMC is a registered trademark of EMC Corporation in the United States and other countries. All other trademarks are the property of their respective owners. © Copyright 2015 EMC Corporation. All rights reserved. Braunschweig, Germany, April 2015 – fme will celebrate the 10th birthday of their EMC certified product migration-center at booth 705 in the Momentum zone of EMC World. Customers and partners are invited to join fme and fme US for birthday cake and a souvenir photo in the exhibition hours between 11:30 am and 5:30 pm on Tuesday, May 5th in the convention centre of the The Venetian. “Momentum at EMC World is the perfect time to celebrate migration-center’s 10th birthday together with our customers and partners. I would like to take the opportunity to thank everyone for their trust in the product and the continuous business” says Florian Piaszyk, Senior Manager fme Products. “We are looking forward to meeting the migration-center users in person and I always appreciate their feedback. This helps us to adapt the product eve better to our customers’ needs in the future” continues Piaszyk. Since 2005 migration-center has developed from a solution with a couple of adapters for different ECM systems to be the leading migration platform for highly automated, large volume content management migrations and has proven in more than 140 international projects that any customer requirement can be met, especially within regulated environments. EMC has certified migration-center in 2014 for the tenth time in a row. migration-center is also the first migration product which has been certified for EMC’s InfoArchive. The adapter allows live archiving of records or decommissioning of legacy systems by archiving structured and unstructured data to EMC InfoArchive and thus helps customers to reduce system complexity and save costs at the same time. Yes, I have read the Data Protection Declaration and consent to the collection and use of my data entered above. The newsletter is published every 6 weeks. You can cancel your subscription at any time by clicking on the unsubscribe link at the bottom of each newsletter. Your address will not be passed on to third parties.